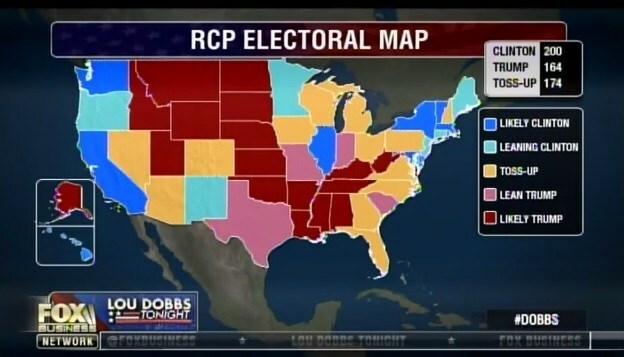 Thirteen US states are now in play in the presidential election. Michigan, Colorado and New Hampshire were moved from “likely blue state” to “toss up” this week. Donald Trump is catching Hillary Clinton in electoral college votes. An election analysis conducted in the Reuters/Ipsos States of the Nation project shows that the race has tightened considerably over the past few weeks, with Republican presidential nominee Donald Trump projected to win Florida, an essential battleground state, if the election were held today. The project, which is based on a weekly tracking poll of more than 15,000 Americans, shows that the 2016 presidential race could end in a photo finish on Nov. 8, with the major-party candidates running nearly even in the Electoral College, the body that ultimately selects the president. The States of the Nation project, which delivers a weekly tally of support for the candidates in every state, shows that the race has tightened in several traditional battlegrounds. Pennsylvania has been moved from a likely win for Democratic presidential nominee Hillary Clinton to a tossup; Ohio has been moved from a tossup to a likely win for Clinton. And Florida is now considered a likely win for the Republican nominee, with 50 percent support for Trump to 46 percent support for Clinton. If the election were held today, the project estimates that Clinton has a 60 percent chance of winning by 18 electoral votes. Last week, the project estimated that Clinton had a 83 percent chance of winning the election. In a separate national Reuters/Ipsos tracking poll, Clinton continues to lead Trump by 4 percentage points, and her recent bout with pneumonia doesn’t appear to have scared away her supporters. The national Sept. 9-15 tracking poll showed that 42 percent of likely voters supported Clinton while 38 percent backed Trump. Clinton, who has mostly led Trump in the poll since the Democratic and Republican national conventions ended in July, regained the advantage this week after her lead briefly faded in late August.